The deeper center cavity and heel-toe weighting increase moment of inertia by more than 25% in this model (over previous ZB 2) and make it as forgiving as an Anser. The heel-shafted weighting is engineered to fit players with more rotation in their stroke and those who have a pull tendency. 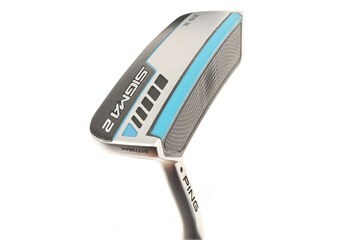 This putter's blade design and medium head weight provide versatility from anywhere on the green. Dual-Durometer Face: A soft front layer ensures precision for shorter, delicate must-makes while a firmer back layer offers solid feedback and distance control for holing longer putts. Adjustable-Length Shaft: The adjustable-length shaft is lightweight, easy to use and sleekly concealed beneath the grip, allowing you to customize length between 32" and 36". TR Technology: Touch and pace are further enhanced with PING's innovative, patented TR face pattern, which varies in depth and pitch to speed up off-center impacts for consistent ball speeds.